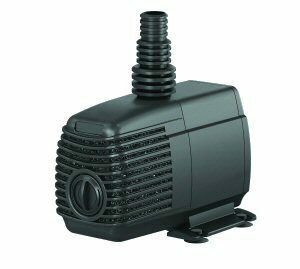 The Aquagarden Mako range offers a cheap and affordable pump without sacrificing performance. Designed for continuous operation due to its magnetic drive design. Features include BSP threaded inlet and outlets for easy installation of pre-filters and fountain kits. Adjustable fountain stem that allows the user to enjoy a perfect fountain effect even when the pump is on an unlevel base. Ceramic impeller shaft for longer impeller life. All make pumps come with a range of fountain kits. 2400 lph, 2.1m max. head, 35 watts.